The rotating union from this series has been an integral component of the DEUBLIN programme for decades, and like all other rotating unions, it has been continuously developed. However, a 1005 rotating union can do more than just bring compressed air to its destination. It is also used in the field of machining processes, where it ensures compressed air supply and/or hydraulics in machining centres, or even manage vacuums. Here, typical tasks include tightening and releasing work-pieces. With technical base parameters of up to 10 bar of air pressure, up to 70 bar hydraulics and 7 kPa vacuums in compact and light design, this rotating union is a true multi-talent with a rotation speed ranging up to 3500 min-1 as standard, and 10,000 min-1 for special designs. 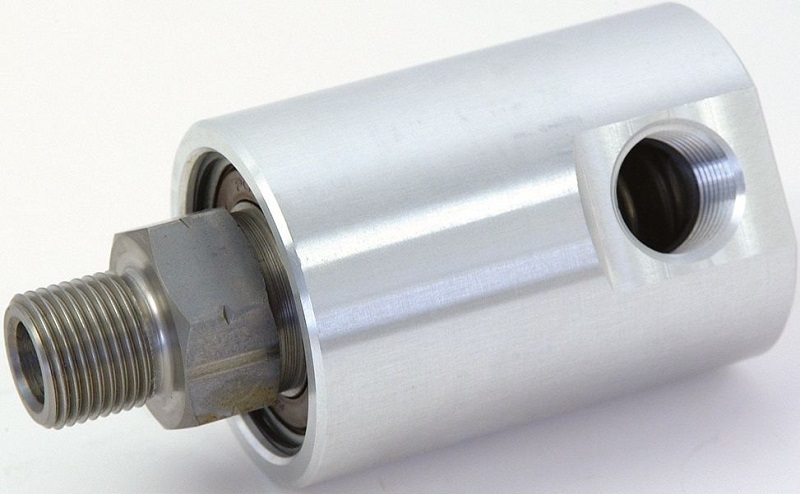 In addition, various mechanical seal combinations, such as carbon graphite, tool steel, ceramics or silicon carbide ensure optimal operation, a long service-life and low maintenance. Customised solutions for special tasks or other parameters can be developed with DEUBLIN’s manufacturer engineering – e.g. for higher temperatures, other pressure ranges or rotation speeds, with special materials for the rotor or other specifications. This makes the 1005 series rotating union a relevant solution for a great range of tasks beyond compressed air.